Investpro Realty Ltd.. specializes in the sales of multi-residential, investment and commercial real estate in the Hamilton and surrounding area. We also provide mortgage financing strategies and referrals; investment planning and budgeting, and provide property management consultation. Dino, former owner of Empex Realty Ltd., brings many years of experience as a Real Estate Broker since 1991, experienced Property Manager, Real Estate investor, mortgage financing consultant and Real Estate investment advisor. 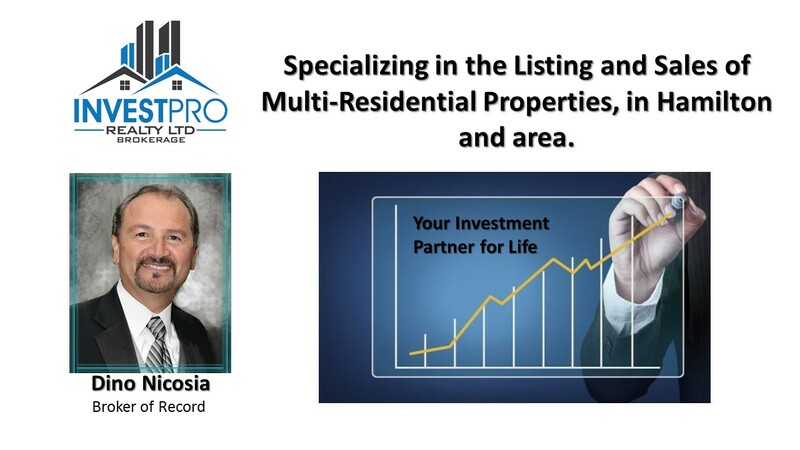 He also brings years of multi-residential expertise to Investpro. Dino has owned and managed his own multi-residential real estate portfolio for over 30 years, and has established a great reputation in the apartment building industry. Please check the many testimonials and investment tips on this website. We serve Hamilton and surrounding area. Over the past few years, Hamilton has scored the top spot on a new list of the best places to invest in Ontario. Let Dino help find the right investment opportunity for you. Before you invest, you deserve the best! 1 – INVESTPRO is highly experienced and understands the current market place. 2 – INVESTPRO is sensitive to the Seller’s interest and will gain the Seller’s trust, confidence and commitment during the listing period. 3 – INVESTPRO’S knowledge and experience with Offer Forms and relating Schedules will remove any uncertainties and will protect the Seller from devious and unscrupulous Buyers. 4 – INVESTPRO’S knowledge and experience will save time by avoiding unproductive brokerage firms not familiar with investment properties. 5 – INVESTPRO will provide a sincere and accurate market evaluation so the Seller will know the true market value of their property. 6 – INVESTPRO will provide the greatest marketing exposure for your property. You deal with a firm that knows who all the current buyers are and how to reach them. This will result in achieving highest possible price. 7 – INVESTPRO will on behalf of the Seller, co-operate extensively with other qualified real estate representatives to bring the Seller the best possible price. 8 – INVESTPRO’S knowledge and expertise during the due diligence process will ensure that the transaction closes smoothly in a timely fashion with no surprise endings. 9 – INVESTPRO’S experience, knowledge and integrity makes the Seller feel comfortable that the fee they pay is very reasonable for the ultimate service and dedication provided.